Stephen William Hawking, born 8 January 1942; died 14 March 2018, was a theoretical physicist who made revolutionary contributions to our understanding of the nature of the universe. Born 300 years to the day after the “father of modern physics” Galileo Galilei died, Hawking added considerably to the understanding of general relativity. Both alone and in collaboration with others, Hawking worked on the theories behind black holes and other cosmology. Born in Oxford, Stephen Hawking was the eldest of four children born to Frank and Isobel Hawking, both graduates of Oxford University in medicine and Philosophy, Politics and Economics respectively. The family later moved to St. Albans in Hertfordshire. From an early age, Hawking showed a passion for science and cosmology and was considered a bright, though a not an exceptional student, preferring to spend time on leisure activities. Frank wanted Stephen to study medicine at University College, Oxford, where he had got his own degree, seeing no career for Stephen in mathematics, his preferred choice. 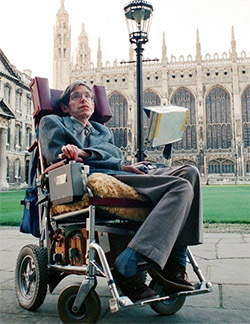 In 1959, at the age of 17, Hawking won a scholarship to study physics and chemistry at University College, since University College did not offer mathematics as an option at the time. He was considered a popular, witty, daredevil character who was keen on classical music, science fiction and was cox of the college rowing crew. Hawking first met Jane Wilde in St Albans; she was a friend to his sister. 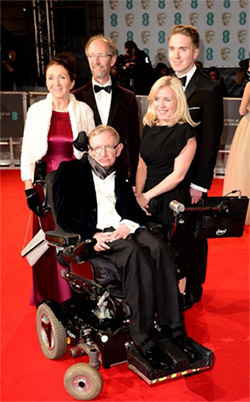 Soon after Hawking was diagnosed with motor neurone disease (MND) and though both Hawking and his father advised her to leave, the couple were married in 1965 and went on to have three children, the youngest adopted. It was only after the wedding that it became clear that Hawking’s disease would not kill him within two years as initially suspected. Caring for her children and husband put huge pressure on Jane, particularly with Hawking travelling so much for work, including a year at the California Institute of Technology (Caltech) in 1974. In 1977, Jane met Jonathan Hellyer Jones at a choir she had joined. They developed romantic feelings for each other but were determined that the Hawking family would not be broken up. Jane is reported to have said that Hawking accepted the situation. In 1985, Hawking had to have a tracheotomy to save his life after contracting pneumonia, but it cost him his voice. One of his first achievements after losing his voice was to draft A Brief History of Time for the general public. Published in 1988, the book sold around 10 million copies globally, introducing the concept of a universe made of strings, black holes, extra-dimensions and time travel. He became a household name, with his work made into a biographical movie, a television series and a number of other books for non-academics. In February 1990 Hawking told his wife that he was leaving her to live with Mason, one of his nurses who had been caring for him since his tracheotomy, whom he married after his divorce from Jane in 1995. He and Mason divorced in 2006. 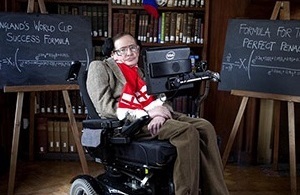 Hawking died in 2018, on the same date that Albert Einstein was born, 14 March. Hawking was awarded a first-class honours degree in 1962, despite being an unfocused student. This led to him being offered a place at Trinity Hall at Cambridge University for a PhD in cosmology in the autumn of that year where his supervisor was the little-known Dennis Sciama, who was to become one of the founders of modern cosmology. Sciama’s knowledge and enthusiasm enabled Hawking to meet and work closely with others in the field. Hawking became a member of the Institute of Astronomy in Cambridge in 1968 and The Large-Scale Structure of Space-Time, written with G.F.R. Ellis, was published in 1973. In 1974, the announcement of Hawking’s radiation theory led to him becoming a fellow of the Royal Society at the age of 32. He later received the Albert Einstein Award, among other honours. In 1977 he was appointed a professor in gravitational physics and two years later became Lucasian Professor of Mathematics at Cambridge University. When Cambridge University posted Hawking's 1965 doctoral thesis, "Properties of Expanding Universes," to its website in October 2017, demand for access was so high that it crashed the university server. Hawking received a vast number of awards for his work over his career, starting with the Adams Prize in March 1966, for his essay "Singularities and the Geometry of Space-Time". Just some of his other awards included the Gravity Research Foundation Award for his essay titled "Black Holes", won in 1970. This was followed by both the Eddington Medal and the Pius XI Gold Medal and in 1976 the Dannie Heineman Prize, the Maxwell Prize and the Hughes Medal, all in recognition of his work on black holes. In 1978 he received the Albert Einstein Medal and an honorary doctorate from the University of Oxford. In the next decade, he was awarded the American Franklin Medal and in the 1982 UK New Year Honours was appointed a Commander of the Order of the British Empire (CBE) by Queen Elizabeth II, with several more awards through to the 21st century. 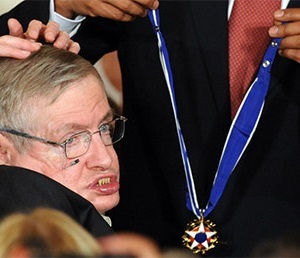 In 2006, Hawking was awarded the Copley Medal from the Royal Society, the Presidential Medal of Freedom in 2009 and the Russian Special Fundamental Physics Prize in 2013. Hawking contributed significantly to the understanding of physics and the study of the nature and origin of the universe. 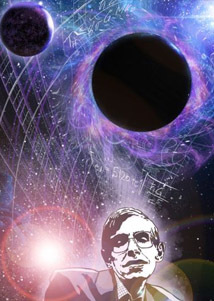 Hawking, with others, established the theory of black-hole thermodynamics, combining quantum (field) theory with those of general relativity and thermodynamics. These are regarded as Hawking’s greatest contributions to science. When Hawking was in his second year at Cambridge. Roger Penrose, another cosmologist, was also researching the creation of black holes (an object from which nothing can escape, not even light). 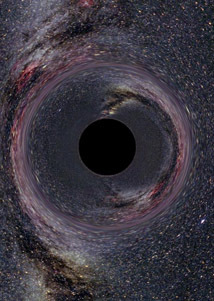 Initially, Hawking and George Ellis, another PhD student at Cambridge, had worked together on a “singularity theorem”, but linking with Penrose, whose mathematical theorem of relevance, incorporating “central singularity” suggested that the collapse of an over-massive star would result in a “black hole”. Hawking also applied this thinking to the entire universe and ran time backwards, predicting that the Universe itself had originated from a singularity. The theory was the basis of his thesis, accepted in 1996. In 1970, Penrose and Hawking published an even more powerful theorem which incorporated almost all previous work in this area. By 1974, Hawking's research showed that black holes aren't the information vacuums that scientists had previously thought they were. Hawking demonstrated that matter, in the form of radiation, can escape the gravitational force of a collapsed star. Hawking was one of the first to combine the theory of Einstein’s general relativity, with quantum physics theory. He considered how quantum particles behaved close to a black hole, predicting that a black hole irradiated a form of thermal radiation, later termed Hawking radiation. Hawking was able to give the precise value “one quarter” for the entropy proportionality constant that others had been unable to determine. This is now known as Hawking radiation. Many more important discoveries followed. In the eighties, Hawking showed that galaxies had originated from early minute thermal irregularities which would then expand during a period of explosive inflationary expansion of the Universe. In 1970, whilst a visiting professor at the Caltech. Hawking worked with Kip Thorne, with whom he made a bet, for a year subscription to a magazine, that the X-ray source Cygnus X-1 was not a black hole. Two decades later, in 1990, Hawking acknowledged that he had lost the bet, the first of many he made with Thorne. In 1997, Hawkings conceded a 1991 public scientific wager made with Kip Thorne and John Preskill of Caltech. Hawking had bet that Penrose's proposal of a "cosmic censorship conjecture" was right, but later added a new bet that was more specific. Thorne, Hawking and Preskill made another bet, this time concerning the black hole information. In 2014, Hawking called the alleged loss of information in black holes his "biggest blunder". As part of another longstanding scientific dispute, Hawking had emphatically argued, and bet USD100 with Gordon Kane of Michigan University, that the Higgs boson would never be found. Dubbed the "God particle" Higgs boson is vital to understanding the Universe, as it is believed to give everything its mass. The particle was discovered in July 2012 at CERN, using the Large Hadron Collider. In 2014, at the invitation of the Irish bookmaker, Paddy Power, Hawking and his team provided two multi-term equations intended to predict the England football teams chances of future success. The report showed that England gets better results playing in a 4-3-3 formation at stadiums less than 500 metres above sea level, in a temperate climate. Red shirts improved the score of more than white shirts. Hawking concluded that the reason why players who are bald or fair-haired will be the best scorers remains one of science's great mysteries.